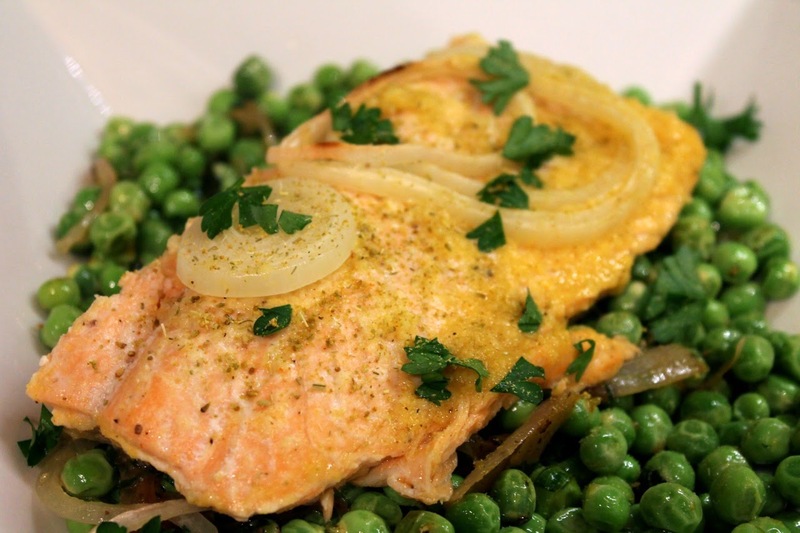 During the spring, I love to serve broiled salmon with seasonal green vegetables like fresh peas. Here, fresh orange juice unites the salmon and peas, with the former also flavored with fresh ginger and a dusting of fennel pollen. 2. Spray a 9 x 9 square baking dish with olive oil. Place about half of the onion slices in the bottom of the baking dish. Lay the salmon on top of the onions. Place the other half of the onions on top of the salmon. 3. In a small bowl, combine the ginger, salt, pepper and orange juice and pour over the salmon. Bake until the salmon flakes with a fork and is cooked through, about 25 to 30 minutes. 4. Divide the salmon into two portions and top with a sprinkle of fennel pollen and fresh parsley. Melt butter in a medium (10-inch) frying pan over medium heat. Add shallots, season with salt and pepper and cook until softened, about 5 minutes. Add peas and stir to coat with butter. After about a minute, add the orange juice. Continue cooking until peas are cooked to desired texture, about 4-5 minutes. Remove from heat and stir in the fresh mint. Yummy! I really liked the orange-ginger coating. The peas were great too.